Should I be doing this at $1/3? I would be interested in someone's opinion of the following line. My default is to be aggressive when in doubt. I have also been focusing on playing more balanced etc since I really want to move up to $2/5. Preflop Action:Villain opens $15 from UTG+2, 4 callers, hero 3b to $100, villain calls, rest fold. Pre-flop Analysis: There is a lot of dead money there and I do not want to go 6 ways to a flop with a premium hand. I use this formula when OOP 3bet= (4 x open) + (open x # callers). The villain is a tight player and I saw him limping a lot (50-60ish white man) and did not see him show down the pots he opened. I put him on a snug range of 88+, AJs+ , QKo+. When he flats there with so much action behind I eliminate AA, AK, KK from his range. 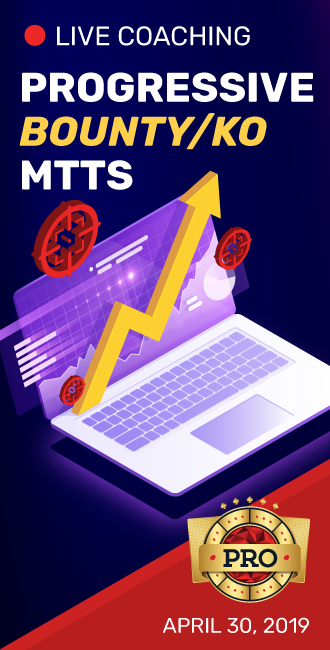 My 3bet range in this situation where I am closing the action is JJ+, ATs-AKs, A2s-A5s, AQo+ and I am flatting a ton of other stuff with those pot odds especially small to medium pairs and suited connectors/gappers. Flop Action: Hero check, Villain bets $75, Hero jams all in for remaining $300, villain calls after about 2 minutes. Post flop analysis: I am checking most of my range here OOP. I tend to use a check-call/check-jam strategy in these situations. I jam with my draws and premium hands (top pair+). The down bet felt weak and he looked uncomfortable to me so I jammed it in with overs and gut shot figuring he is only calling me with sets (9 combos), AKh, AQh, QQ. I didn't think he had AA or KK in his range, since I thought he'd 4bet me preflop. No sure why he didn't snap me off especially considering he did NOT have the . I ran out running QQ to scoop a big pot, but I'm not sure if check jam there is +EV or not against a relatively nitty $1/3 opponent. My range analysis was obviously off since he showed up with KK. Maybe he only calls TT-KK, AK and exclusively 4bets AA? It worked out in my favor since I sucked out, but I am trying to figure out if it was a "good play" or not from a strategy standpoint. I don't like the play. How many combos of Jack's nines, eights, and QJ are you 3 betting in this spot? If the answer is none, villain is basically just deciding if you have aces or not. The play you made is fine in a single raised pot, but not a 3bet pot imo. First of all thank you for the awesome write-up. Makes me motivated to dive into it. On to the hand and your analysis. I probably agree with villain's opening range, but does he really call such a big 3-bet with 88 or 99? I would say TT-QQ, AK and AQs would be more realistic given your profile of villain. .
Now suddenly against this range you could consider c-betting to fold out AK and AQ which don't have a (backdoor) flush draw. Anyway, when he bets I generally discount AQ and AK without a suit, and worst case he bets all TT-QQ. So that's AQhh, AQdd, AKdd, AKhh, AhKc, AhKd, AhKs, 6 combos of TT, 3 combos of JJ, and 3 combos of QQ, totalling 19 combos. Villain folds over 31% of his range, so yes I would say it's +EV based on my own assumptions. Maybe you could do the same for your assumptions? I am fairly value heavy here maybe I need to 3 bet a few more combos pre-flop so I can have a better balance on the flop. How am I to assign him KK though when he just flat calls, from UTG+2 with 3 potential callers to take position from him? I guess he does not have a 4-bet range besides exactly aces? The crux of my mistake is assigning him an incorrect pre-flop flatting range. Obviously, if I know that he can show up with kings or aces I would not play as above. 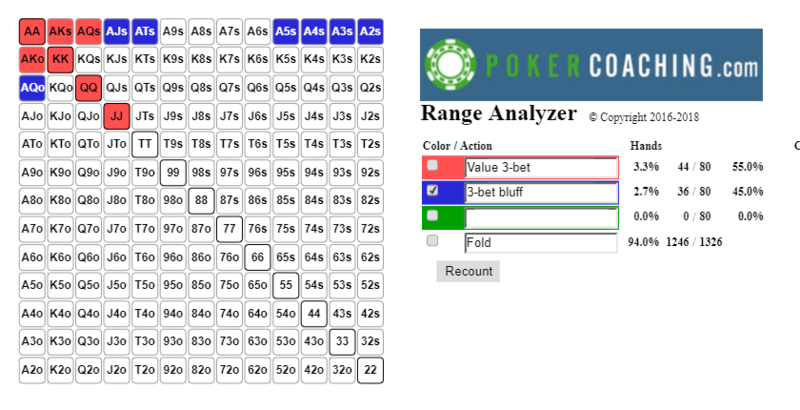 I make the play trying to generate folds from his AQs (non-heart), AK (non-hearts) and maybe TT from the range that I assigned him originally. Why is this play bad in a 3-bet pot as opposed to a single raised pot? What would your action be as played? Would you check like me, or lead out? What would you do in the exact situation where you check and he downbets to $75? Thanks for the reply. I appreciate it. I'd just like a little more constructive feedback, if you have time, please. If he's tight and you've seen him limping a lot, I think you have his open-raise range way too wide. Good point. I think my pre-flop range assignment is totally off as evidenced by what he showed up with! Ha, right, that is more compelling evidence. On to the hand and your analysis. I probably agree with villain's opening range, but does he really call such a big 3-bet with 88 or 99? I would say TT-QQ, AK and AQs would be more realistic given your profile of villain. I agree with this statement. I felt like when he just flatted with that action behind that he may be inappropriately set-mining but not realizing that he is not getting the appropriate odds which is why I assigned 88,99 too. I had not considered a c-betting range, I felt like a C-bet would be more powerful and generate fold equity especially if he takes a small stab with his bluffs. I would say he would only call with JJ, QQ, AQhh and AKhh, meaning he folds 11 of 19 combos. You have 18% equity against this range. 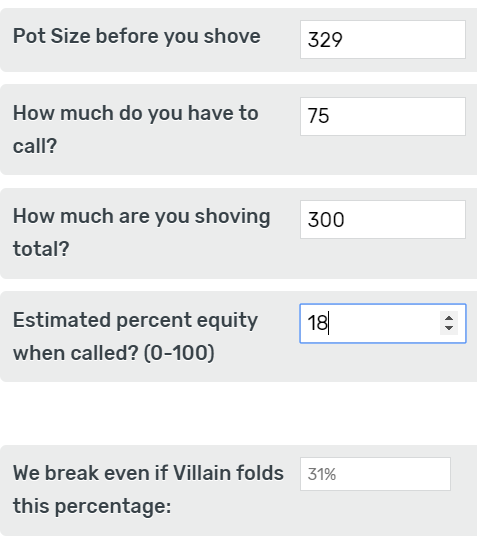 Let's plug it into a calculator: Villain folds over 31% of his range, so yes I would say it's +EV based on my own assumptions. Maybe you could do the same for your assumptions? All well and good until he shows up with KK there. Ugh! I also thought he felt weak based on some of his body language. So if I'm understanding you correctly, you have 18 bluff combos on this flop but only 15 value (6 combos of AA, 6 combos of KK, and 3 combos of JJ). You're overblufffing. If you're going to have 18 possible bluffs on this board, you need to have more value combos. Make sure you tuck this nugget away in your mind if you ever meet with this V again. By default I think you are correct to take KK out, but taking it out vs this V again will be a mistake. I would not say that having a 6:5 bluff:value ratio is necessarily overbluffing as it depends on multiple factors. In most flop situations I endeavor to have 2:1 bluffs: values. This is obviously a different situation. I reshove $225 more into a pot $254+$75+$225 ($554). In general I want to have (x % bluffs) where x is the pot odds for the opponent to call. Therefore, in this situation I agree that I am overbluffing and unbalanced since my target bluff% based on my bet sizing would be 28.9% which I am significantly over with my bluff % being 54.4% in this exact situation. I'll pass on the xr portion, as that looks reasonable given assumptions. You see, that dead money works both ways- there is more for him to capture too and it works against him by becoming more live when he just calls. Flatting the squeeze aready creates a 1.2 spr pot, so when he calls and lays a better price to the field, the spr will reach a point where he may have to go with Ace high on the flop- making a call is one of his worst options with non-made hands, when FE and protection were open to him. This narrows a rational range significantly. Further, he should/could reverse his choices by flatting AA and reraising KK, if he is going to mix in these actions and punish squeezes the most while gaining the most value and protection. This, good sir, is why I am not a profitable player. I greatly appreciate your reply and wisdom. I had not considered that logic/line in this particular hand. When I am in absolute position and I have a premium hand like AA/KK I do flat some % of the time to 3-bets. However, I have never considered that in a situation like this since I am compelled to pile my money in the middle ASAP. This is why I am still at $1/3! I think the SPR that is created with such a large 3bet is going to get us in a nasty spot quite often. If we dont scoop the pot pre we just dont have a lot of wiggle room with our merged 3bet range. Casey, I think I am doing that unintentionally. My intention was to bet a polarized 3bet range. In my mind 55% of my 3bet range is for value and 45% is a "bluff." I add in the wheel aces to polarize things a bet. What would be an example of a good polarized and merged 3-betting range in this instance? I fear I do not truly grasp what merged versus polarized is since my intention was to be polarized when I am squeezing from the BB. Not an issue. We take the position at RCP that we succeed in a competitive market through the strength of our products, not through censoring nor denigrating our competition. There are a few videos here on RCP that explain poled vs merged as well as a few forums discussions. Id definitely look those up. Im still learning so Ill do my best. ATs+ typically needs a few streets to realize its equity so if we 3bet it, we want a bigger SPR to bet flop and turn.These hands will rarely make the best hand on the flop. In other words, 3betting AQs is going to require more bets to win a pot. QQ+ on the other hand will be the best hand on a lot of flops and doesnt require a few barrels to realize its equity. So in this particular hand, even 3betting to $60 would result in $174 in the pot with $340 behind. Still not a great SPR for a hand that needs a few barrels to make the bast hand. Given the range you assigned his open (88+, AQo+, AJs) and assuming a continuing range of (JJ+, AK), a squeeze seems to be borderline. If you play with his ranges a little bit. say, adding more hands to his continuing range (TT, AQs) it becomes even worse. In that case, i think constructing a polarized squeeze range here is wrong to begin with. Having said all that, When you 3-bet and get called you are isolated by a range that crushes AQs and i would proceed cautiously and c/f most of the time. Also I’ve made the mistake and assumed bc I know what a 4 bet range is other people do too and they don’t. Most ppl arnt thinking range v range. They won’t even consider it but they are crafty, crafty enough to know KK is a big enough hand and to only call against an aggressive player like me and let me blast off my stack into them. Discussion Should I be doing this at $1/3?